Waterproof PVC Tarpaulin - 610gsm heavy duty PVC made with a polyester base cloth, coated in PVC. It is a durable, UV stabilised high strength waterproof and rot proof cover. It is also available as a flame retardant option. Re-enforced taped edge, welded for strength. 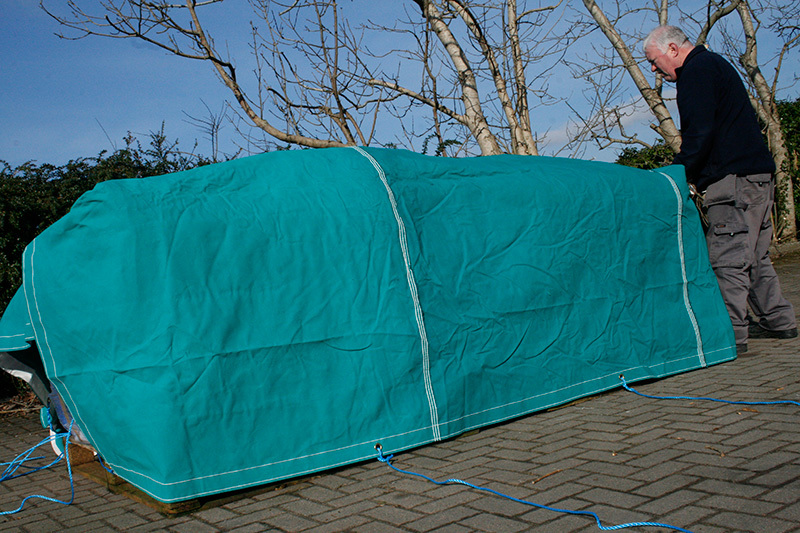 The finished tarpaulin with re-enforced taped edging, welded for strength, and brass eyelets is equivalent to 640gsm. Eyelets can positioned to your specification with a choice of industrial elastic (bungee loops) or rot proof rope. 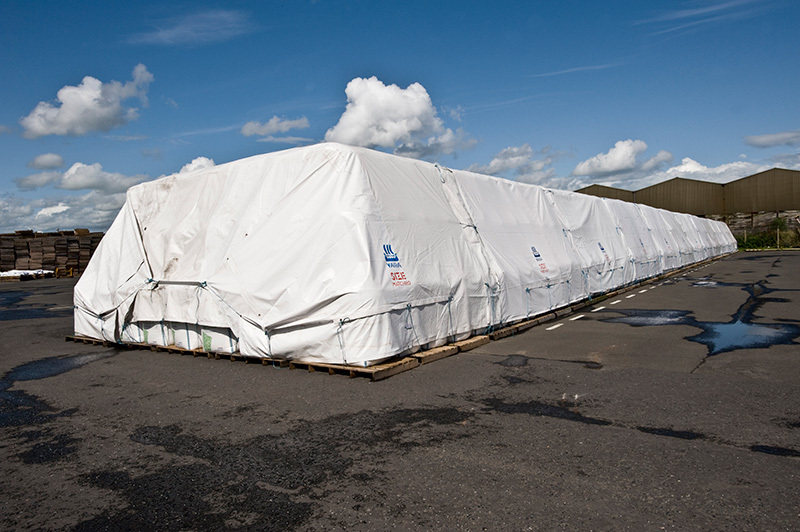 A Cunningham PVC tarpaulin, made to measure to suit any shape or size is the perfect protection for high value assets. Company names logo-style or other branding can be applied to the cover using Cunningham's state-of-the-art print system ensuring a professional and elegant finish. If you have a similar issue or indeed if this solution would work for you submitting an enquiry is easy and we'll get right back to you with a quote. If you prefer you can call us on 028 7964 2638 from the UK or 004428 7964 2638 from Ireland. We accept orders online or by phone. High grade 16oz cotton canvas is the best natural grade cotton canvas available to buy. It is a natural material which is both waterproof and breathable. Cotton canvas is made from 100% cotton, contains no man-made or artificial fibre component so therefore it does not melt, distort or degrade with exposure to high temperatures. Made in 16oz cotton canvas. Fully waterproof and UV resistant. Solid brass eyelets and bungee loops or cord fitted if required. Before using a canvas for the first time, it will need to be preconditioned or 'weathered' in order for it to have its own natural water repellence. Set it up and pre-soak the cover with water using a garden hose or similar. Avoid using high pressure washers as this may remove the surface proofing. The fabric needs to completely soak to allow the fabric to swell and relax/shrink back to tighten the weave on drying. This wetting/drying process will not only allow the canvas to condition and gain its full water proofing properties, but it will also help to close up the stitching holes. The process of weathering may take more than one attempt if you are wetting angled canvases such as canopies, but from experience two attempts normally suffices. Never put a damp canvas cover into storage! Ensure that the canvas is fully dried before packing away. All natural fabrics are susceptible to mildew. For mildew to grow it requires food, heat and moisture. Mildew will result quickly on canvas if folded away wet or stored in a damp place. Before storing, wash off any dirt, animal droppings and vegetation such as leaves with a hose as these can also promote mildew growth and staining on your canvas when stored. Leave to dry naturally before storing away.